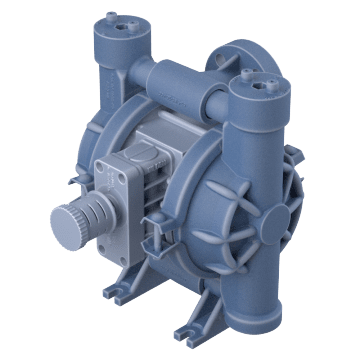 Pump low- to high-viscosity liquids, gases, and liquids containing high volumes of solids with these highly efficient, air-operated double diaphragm (AODD) pumps. 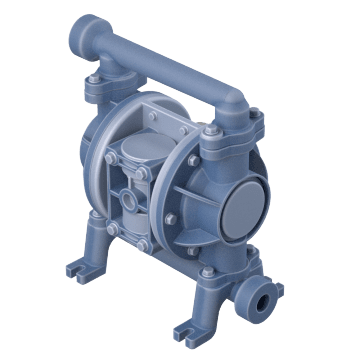 Double diaphragm pumps, also known as membrane pumps and mud pumps, allow for more even, nonpulsing material flow over a wide range of flow rates than single diaphragm pumps, and reduce the possibility of pressure buildup within the pump. They have a sealless design which helps reduce leaks, and are self-priming, able to run dry for limited amounts of time, portable, and won't overheat. Driven by compressed air, these pumps are a better choice than electric in hazardous environments where sparking is an issue, or in areas where electricity isn't readily available. 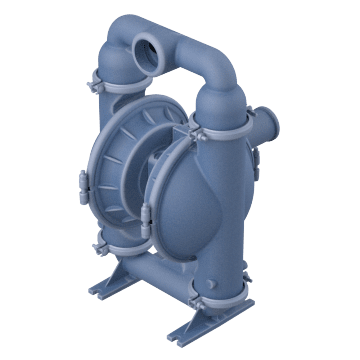 These pumps are commonly used to pump slurries and wastewater in shallow depths but can also handle gases and gas/liquid mixtures. Driven by compressed air, these pumps are a better choice than electric in hazardous environments where sparking is an issue, or in areas where electricity isn't readily available. 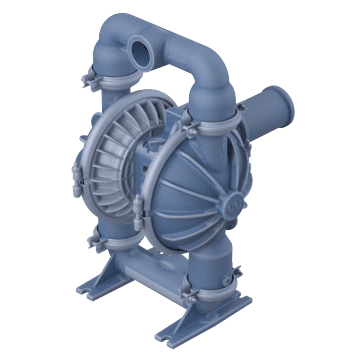 These pumps are commonly used to pump slurries and wastewater in shallow depths but can also handle gases and gas/liquid mixtures. Move fluids with a high resistance to flow, liquids that are able to dissolve other substances, and mixtures of liquids with small solids. 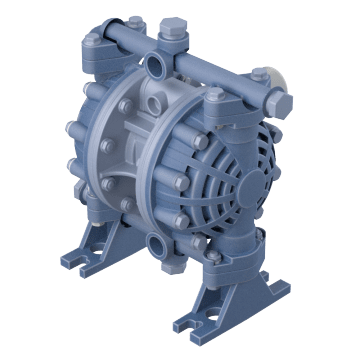 These pumps are constructed with abrasion- and corrosion-resistant materials for pumping slurries and solvents, and an all-bolted housing to withstand the increased pressure of pumping viscous fluids. A freestanding support base allows you to move the pump where you need it. 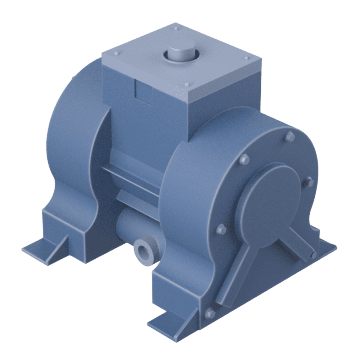 These pumps are made from rugged materials that can withstand wear from abrasive materials when moving fluids with small solids. They are best suited for intermittent or on-demand use. The exhaust valves on these pumps move cold exhaust air away from the internal pump components, preventing them from icing over during use. Idea for use with cold material to prevent freezing during operation, they are designed with unbalanced air valves to help reduce stalling, making them a good choice for wastewater treatment, bulk transfer, and some chemical applications. 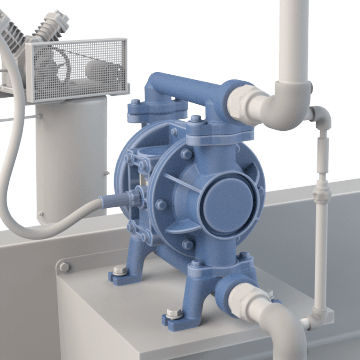 Designed for easy maintenance, these pumps are constructed with a standard-duty band clamp instead of being bolted together, allowing them to be quickly disassembled when needed. The air valve system is designed to help reduce stalling. 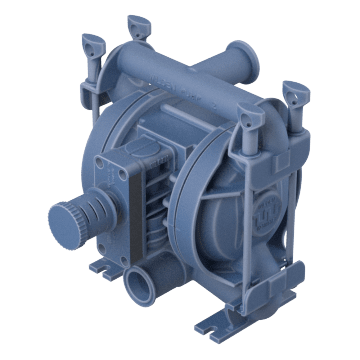 Commonly used for handling a broad range of chemicals in light commercial and industrial applications, these pumps have a shuttle valve to reduce stalling and a polypropylene body for chemical resistance. They also have plug-in port fittings that help to ease installation. 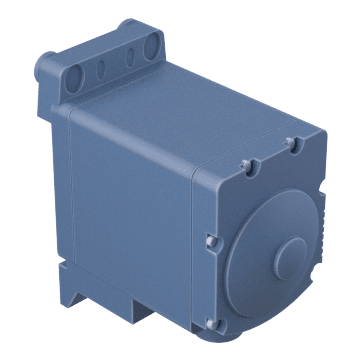 Protect your pump from corrosive chemicals with a housing constructed of Kynar, a high-performance fluoropolymer resin, which is excellent for applications that require good chemical resistance at higher temperatures. 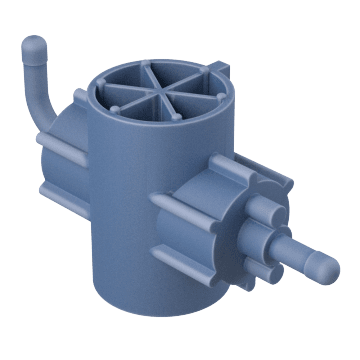 The pump also has an all-bolted, injection-molded body for extended life, and a spring-assisted air valve with seal rings that don't need to be lubricated. For chemical applications that require very accurate flow rates, these pumps are capable of deadheading, or quickly closing the pump's discharge valves to stop the flow of material, without resulting in pump damage. Also known as sprayer pumps, these pumps are designed for the toughest pumping applications such as chemical transfer, liquid fertilizer injection, and agricultural spraying. They have a corrosion-resistant housing and can operate with carbon dioxide, nitrogen, or clean, filtered compressed air.